So you have made up your mind to start a company in Hong Kong, but have you thought of your company’s name yet? If not, you should start thinking about it. If you have, you need to get it approved and register it. 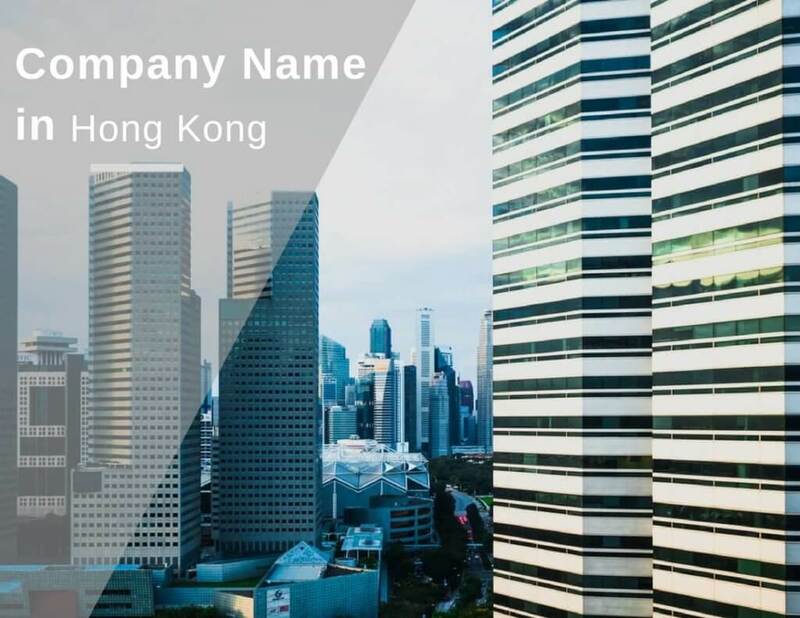 Companies are required to register a unique company name in Hong Kong, and one that does not resemble or infringe on existing company names. After choosing a company name, you can get it reserved during the company incorporation. If any other entrepreneur wishes to register the same name, they would be able to see that the name has already been taken. This way, no two companies would have the same name. For registering your company’s name, you need to register it with the Company Registry. Also, keep in mind to incorporate your company within one month of starting the business. A company can be registered in Hong Kong with an English or a Chinese name. You cannot combine English words/letters and Chinese characters for naming your company. It is offensive or otherwise contrary to the public interest. The definite article, where it is the primary word of the name. For instance, The Tech Limited = Tech Limited. The ending words or expressions “company,” “and company,” “company limited,” “and company limited,” “limited,” “unlimited,” and their abbreviations. For instance, Tech Company Limited = Tech Limited = Tech Co. Limited. Type or case of letters, spaces between letters, accent and punctuation marks. For instance, T-E-C-H Limited = t e c h Limited. which would possibly give the idea that the company is connected in any way with the Government of the Hong Kong Special Administrative Region, the Central People’s Government, any department or agency of either Government. Such a company name will be permitted only where it is verified that the company in question has a substantial connection with the Central People’s Government or the Government of the Hong Kong Special Administrative Region. The use of words such as “Department,” “Government,” “Commission,” “Bureau,” “Federation,” “Council,” “Authority,” would generally imply such a connection and will not usually be authorized. Before applying you should seek the advice of the Registrar about the above types of names and should apply in writing to seek the consent to use these names. The Applications will be sent to the New Companies Section of the Companies Registry. Those who are investing in Hong Kong and considering a company name, need to perform a company name check with the Registrar of the company. The Registrar maintains a special Index of Company Names, where registered company names can be confirmed. You can also check if a certain name was previously used by another company or not. And the best part is all of the above information will be free of cost. Pro Tip: Use the search mode “Exact Name Search” while conducting the company name search. Also, input the full and exact company name that is intended to be used, including all spaces, punctuation marks, and ending terms like “Company Limited,” “Limited,” “Company” etc. Only English or traditional Chinese characters should be used as the search language. Inputting other languages or simplified Chinese characters may lead to incorrect searches, resulting in a “no matching record found” message. Why is A Company Name Verification Important? The company name verification is necessary as it enables the entrepreneur to check if the chosen name is the same as another or if it closely resembles it. With the help of the checker tool, your company name is matched with the list of previously registered company names. Hence, to ensure that the intended name is not the same as any of the names on the list, company name verification is important. The registrability of a company name can only be confirmed after the application documents have been processed by the Companies Registry. For this, the entrepreneur needs to have a unique company name and company name verification can help you with it. With the trademark search at the Intellectual Property Department’s Online Search System, the risk of “passing off” or trademark infringement is avoided. If you wish you change the company name after incorporating it, it can be changed by special resolution. Within 15 days after the date of claiming the special resolution, the company must produce to the Registrar for registration notice of the change of company name under section 107(2) of the Companies Ordinance. The requirement to deliver a copy of the special resolution to the Registrar for registration under section 622 of the Companies Ordinance does not apply to change of name cases. The Registrar will not require the delivery of a notice of alteration of articles and a certified copy of articles as altered under section 88(5) of the Companies Ordinance about a change of company name. If a company is restored to the Companies Registrar after dissolution, it is restored under the same name that it was registered immediately before it was dissolved. However, within 12 months of restoration, the Registrar may direct the company to change by notice in writing, within the period specified in the notice, a name under which it is restored to the Companies Register if the name is, as at the time of the restoration, the same as is too like a name that appeared or should have appeared in the Index of Company Names; or the name is, as at the time of the restoration, the same as the name of a body corporate incorporated or established under an Ordinance. Need more details about how to choose and reserve a company name in Hong Kong? Visit Startupr or feel free to call us! Our company formation specialists in Hong Kong will help you with all matters related to the company name & registration in Hong Kong.